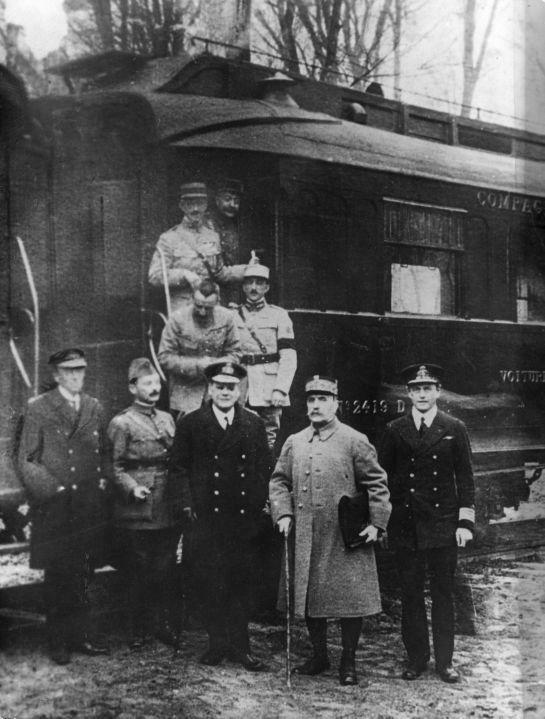 On the chilly morning of November 11, 1918, German and Allied leaders gathered in a railway car in a forest near Compiegne, France. Germany had suffered stinging defeats in the Allied hundred days offensive, and the German economy was in shambles. After three days of negotiations led by France’s Ferdinand Foch, the time had come to admit defeat. Germany signed the Armistice agreement in Foch’s personal railroad carriage. The Armistice would bring an end to fighting in World War I. The Great War resulted in more than 37 million military casualties worldwide! The Armistice would take effect six hours later, at the 11th hour, of the 11th day, in the 11th month. The delay allowed time for the news to travel along the Western Front. Terms of the Armistice included: Germany’s surrender of military weapons and hardware; the release of POWs; immediate evacuation of occupied lands in Belgium, Luxembourg, France, and Alsace-Lorraine and other occupied territories; and Allies would occupy land in Germany creating a neutral zone along the Rhine River. The Armistice was a short-term agreement intended to end fighting. After it was signed, Allies gathered in Paris to draft the more comprehensive Treaty of Versailles. That treaty required Germany to accept responsibility as the aggressor and for loss and damage suffered. It was signed the following year. America and its Allies tallied the dead and wounded. The war to end all wars was over, but in the process, a generation of common young men distinguished themselves with uncommon heroism and valor. Soldiers like Pfc. Walter A. Shaminski who entered a cellar to set up a telephone but encountered 11 enemy soldiers. He single-handedly killed two and took nine prisoners. He was later awarded the Distinguished Service Cross. Or cook Harry C. Ricket, who fed exhausted soldiers even though his kitchen was under intense bombardment. He collected water for cooking from a spring that everyone else refused to approach because of heavy shelling. Alvey C. Martz engaged in heavy fighting after Germany launched its last drive to Paris before the Armistice. His unit was overrun and he found himself surrounded behind enemy lines – his only weapon a pistol. Despite the odds against him, he killed a large number of the enemy and made his way back to his regiment. He was also awarded the Distinguished Service Cross. The Armistice brought joy, relief and mourning. Pershing’s Expeditionary Force suffered 323,000 casualties and nearly 117,000 deaths. Germany’s humiliating defeat would contribute to the rise in Nazism just 20 years later. But for now, the boys were finally coming home. To learn more about WWI, search our archives on Fold3.com! This month we’re excited to highlight our collection of Ohio Soldiers Graves Registration Cards. This archive consists of index cards for soldiers who fought in conflicts from the War of 1812 through the 1950s. The cards contain a wealth of information and provide a jumping-off point for further research. The soldiers in this index were not necessarily from Ohio. The Soldier’s Home in Dayton, Ohio, was one of the first three Soldier’s Homes established by Abraham Lincoln after the Civil War. It provided care for soldiers disabled through loss of limb, wounds, or disease as a result of their service in the Union in the Civil War. Consequently, soldiers from outside of Ohio are found in this index if they were residents of the Home. In the following three examples, we’ve selected three random Graves Registration Cards and using the clues found on the cards, researched more about the lives of those soldiers. Edward Eades was from Bowling Green, Kentucky and enlisted in 1864 as a private in Company “C” of the 115th U.S. Colored Troops division. Knowing the division Eades served in allows us to research the movements of those troops. The 115th saw action in Petersburg, Richmond, and eventually sailed to Texas for duty in the District of the Rio Grande, before being mustered out. By cross-referencing his Civil War Pension Index card we learn that Eades had obtained the rank of 1st Sergeant when he was discharged in 1866. Eades was living in the Soldier’s Home when he died at age 77-years-old from Nephritis (chronic kidney inflammation). The Graves Registration Card also lists his next of kin, nephew Edward Campbell from Greenville, Kentucky. This information opens the doors for further research into Kentucky archives. A second example is that of Carl Babcock. He served in France in WWI with the 101st Regiment, 26th Division. His WWI Draft Registration Card lists his address in 1917; his marital status (single); and his physical characteristics. He was from Napoleon, Ohio, and a search of the archives at Newspapers.com reveal that he was serving as the Fire Chief when he died. The Graves Registration Card records the location of the cemetery he was buried in. We searched Findagrave.com to find his page. It lists his parents, spouse, and siblings. A final example is that of Thomas V. Rabbitt. Rabbitt fought in the Spanish-American War. He was from Massachusetts and died in the Soldier’s Home in 1924 at 54-years-old of acute alcohol poisoning. We learn from his Grave Registration Card that he was from Milford, Massachusetts. A search on Ancestry reveals his birth record that includes the names of his parents; his marriage record and his 1900 census record that lists his occupation as a quarryman. Further research of records related to the 6th Massachusetts Infantry Company “C” revealed that about two weeks after enlisting, Rabbitt joined with his infantry where they fought during the bloodiest battle of the war in the charge up San Juan Hill in Cuba. Do you have an ancestor included in the Ohio Soldiers Graves Registration Cards? Search their records on Fold3! Loyalists had a variety of reasons for supporting Great Britain. Some were successful merchants who relied on a working relationship; others were pacifists who wanted to avoid war; and some served in prominent roles appointed by the British government. One prominent Loyalist was Thomas Hutchinson who served as the Governor of Massachusetts. Hutchinson was born in Boston and was an avid collector of historical materials related to early Massachusetts colonial history. In 1765, after the Stamp Act, angry colonists burst into his Boston house, ransacked it and destroyed the contents. Hutchinson and his family barely escaped. Most of the historical documents were destroyed. Hutchinson was eventually replaced as Governor and left the colonies for London, where he later died. Patriot or Loyalist? The question created division within communities. In a letter to John Hancock, George Washington expressed concerns about Loyalists who are “in Arms against us.” Yet Washington wanted to leave the door open for those who were willing to join the revolution. “I should suppose, that it would be expedient and founded in sound policy, to give every suitable assurance to induce them to come. Such an event would be attended with Salutary effects – would weaken the enemy – distress them greatly and would probably have a most happy influence in preventing Others from joining their Arms,” Washington wrote. In order to alleviate the burden on British troops, British officials developed a plan to enlist more loyalists to fight. Lt. General Charles Cornwallis rallied Loyalists in southern colonies. They initially had success at the Battle of Camden in South Carolina, but as they marched north, many Loyalists feared retribution and inadequate protection and chose to stay out of the fray. Cornwallis issued a proclamation urging Loyalists to take up arms. “It is his Majesty’s most gracious wish to rescue his faithful and loyal subjects from the cruel tyranny under which they have groaned for several years,” Cornwallis wrote. “I invite all such loyal & faithful subjects to repair without loss of time with their arms and ten days Provisions to the Royal headquarters now erected at Hillsborough, where they will meet with the most friendly reception.” His proclamation did not elicit the volunteers he needed. Cornwallis was eventually defeated at Yorktown and the military aspect of the American Revolution ended. After the revolution, some Loyalists chose to remain in the colonies and were offered protection without fear of retribution under the Paris Peace Treaty. If you would like to learn more about the role of Loyalists in the American Revolution, search our Revolutionary War collection on Fold3.com! The Battles of Saratoga were two battles, fought 18 days apart in 1777, and are considered a turning point in the Revolutionary War. When they were over, British Gen. John Burgoyne and his army of nearly 6,000 surrendered. As a result, France recognized America’s independence and entered the war as an American ally. The British strategy was a three-pronged approach meant to cut off New England from the Southern colonies. Burgoyne would march his army (that consisted of British soldiers, Hessian soldiers, and Native American scouts) south from Canada. He would then rendezvous with two additional British armies led by Barry St. Leger and Sir William Howe. Those armies never showed up. Barry St. Leger’s army was turned back by forces led by Benedict Arnold; while William Howe decided to use his army to attack the Patriot capital of Philadelphia. That left Burgoyne’s troops alone to contend with the Continental Army. Emboldened by his success at capturing Fort Ticonderoga, Burgoyne continued down the Hudson River Valley. As Burgoyne’s troops approached the John Freeman farm in upstate New York, the Northern Department of the Continental Army led by Gen. Horatio Gates, along with Benedict Arnold, were waiting (just two years later Benedict Arnold would enter secret negotiations with the British). On September 19th, the two armies engaged at Freeman’s farm. Fierce fighting led to casualties on both sides, though British casualties numbered twice that of the Continental Army. Still, the British held their ground. Burgoyne pulled back to regroup. He was running low on supplies and was still waiting for troop reinforcements that never arrived. In the meantime, the Continental Army came in from behind and cut off the British supply lines. On October 7th, a second battle known as the Second Battle of Freeman’s farm or the Battle of Bemis Heights was fought. British and Continental armies engaged in heavy fighting. Colonists were strengthened by a fresh brigade led by Brig. Gen. Benedict Arnold. The Continental Army surrounded overwhelmed British troops who later negotiated a surrender under the Convention of Saratoga. The Convention required British troops to lay down their weapons and return to Great Britain with the condition they not serve in North America during the rest of the war. The Battles of Saratoga were the impetus for the French to enter the war. France recognized America’s cause and provided financial and military assistance. If you would like to learn more about the Battles of Saratoga or other Revolutionary War battles, search our Revolutionary War collection on Fold3.com! New Naval Records Added to Fold3! This month, Fold3 is pleased to highlight two new collections of naval records we’ve added to our archives. The first collection is Letters Received by the Secretary of Navy (“Captains’ Letters”) dated 1805-1885. The second collection is Letters Received by the Secretary of the Navy from Commanding Officers of Squadrons between 1841-1886. These letters are in original manuscript form. The Captains’ Letters collection is organized by year and contains correspondence from captains at sea to the Secretary of the Navy related to a variety of issues, including shipboard discipline, repairs of vessels, and conflicts with foreign governments. For example, this letter is from Captain Stephen Decatur. He was the youngest man to reach the rank of captain in the US Navy. In January 1812 he wrote to Secretary of the Navy Paul Hamilton requesting a court-martial for seaman Daniel Dailey. Dailey had strangled his fellow seaman, William Brown. Another example is this letter from Captain Sam Evans. He informed Secretary of Navy Benjamin W. Crowninshield about a duel that had taken place in 1817 between Lt. Richard S. Heath of the USS Saranac and midshipman John D. Hopkins of the USS Enterprise, that resulted in the death of Heath. In addition to captains’ letters, there are letters from the commandants of navy yards and shore facilities like this letter from Thomas Tingey of the Washington Navy Yard. It’s dated July 1805, and was sent to Congressman Charles W. Goldsborough to inform him that the heavy canvas needed to make sails for the brigs USS Hornet and USS Wasp was available. Our second new collection contains correspondence from commanding officers of squadrons. This collection is organized by squadron location; date; and finally alphabetized by the author of the letter. In this letter from the James River Flotilla during the Civil War, Commander Maxwell Woodhull wrote to Commodore Charles Wilkes commending a gunner’s mate named John Merrett. Merrett was sick during an engagement at Harrison’s Landing, but managed to get out of bed and report to his station. There he bravely engaged and repelled the enemy, then collapsed from exhaustion and had to be carried to his hammock, where he almost died. In 1864, the steamship USS Connecticut was part of the North Atlantic Blockade Squadron. In this letter to Rear Admiral Samuel P. Lee from May 1864, Captain John J. Almy described a dramatic four-hour chase to capture the English Steamer Minnie. To avoid capture, the Minnie dumped 40 bales of cotton, but she was still taken. She contained 540 bales of cotton, 25 tons of tobacco, 12 barrels of turpentine and $10,000 in gold, and was one of the most valuable prizes taken during the war. On board, they discovered Lt. Lincoln C. Leftwich of the Confederate Army. He was taken prisoner. Come search these historic naval correspondence collections and other naval records, on Fold3! During the Civil War more than two million soldiers left their families, homes, farms, and jobs to join the fight. The women were left to maintain the home front. This shift brought increased responsibility and opportunity that would shape the country long after the war ended. Women were needed to fill critical gaps outside of their typical domestic spheres. In addition to managing homes and families, women worked in factories, mills, and munition plants. They sewed uniforms and bandages. Some served as nurses, such as Carrie Wilkins Pollard, who spent two years caring for the wounded. In 1892, she appealed to Congress and was granted a pension. Although women weren’t eligible to enlist as soldiers, as many as 400 did; many under male aliases. During the war, many soldiers suffered injuries that resulted in life-long disabilities, including thousands of amputation surgeries. After the war, men and women had to navigate and define new roles and responsibilities. Many women had become accustomed to making decisions, managing finances, and operating farms and businesses. With the men back home, adjustments were required. Some had to adjust to the fact that their men were never coming home. The death of 620,000 Americans left the country stunned and mourning. Typical of mourning practices at the time, many widows donned black dresses to express their grief. Widows of Union soldiers were entitled to a federal pension. Confederate soldiers and widows weren’t eligible and needed to apply to the individual state where they resided to receive a state pension. It wasn’t until the 1900s that federal pensions were available to all Civil War soldiers and widows. Women emerged from the Civil War with a taste of social empowerment that permanently shifted their attitudes. Wartime exposure to responsibilities traditionally managed by men taught women that they were, in fact, capable of filling these roles. This gave a boost to the suffrage movement, and in 1869, the National Woman Suffrage Association formed with the goal of procuring the vote for American women. Search our Civil War archives, including the Civil War Pensions Index and the Civil War Widows Pensions file to learn more about the role women played during the Civil War!